This cozy two bedroom, two bath home is located in a lovely compound not far from the Santa Fe Plaza. The home features brick floors throughout and a kiva fireplace in the living room. The comfortable dining area is conveniently situated between the kitchen and the living room. 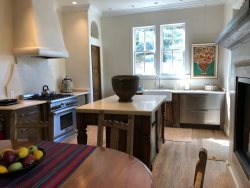 You will find the home is decorated with a Southwestern flair and offers a king bed in the Master bedroom while the guest bedroom offers two twin beds. Come stay and feel right at home!